Like the zillions 'O stories languishing away here in the fields of Nofendersville... This story has failed to escape the gravitational pull of that all fearing No Fenders Wormhole Vortex and hence I've just finally managed to pull I-T free! As arguably Messer Surtees is the most famous of the two-wheel warriors to cross over into the realm of four wheels, specifically single seaters, since after all this is the supposed home of No Fenders, Ja Volt! As here's the story from Grizzled Journo' Joe Saward that I believe got me started upon this topic 'Wayback a long, long, time ago - like at least four years ago; YIKES! John Surtees is the only person to have won a world championship in both disciplines, having won multiple Motorcycle titles along with capturing the Formula 1 world championship for la Scuderia (Ferrari) in 1964. Surtees who won a staggering 32-of39 motorcycle races between 1958-60 left for single seaters at the age of 26. (Same age as Casey Stoner, I believe...) Winning multiple Grand Prix's - along with giving Honda its last win as a Constructor in the late 1960's before their eventual return to Grand Prix racing in the 1980's, first as an engine supplier and then ultimately a Constructor before quitting F1 in 2008. The rider was so naturally gifted that he was bestowed the nickname "Mike-the-Bike," winning an astounding nine motorcycle world championships plus 76-victories before switching over to racing cars, where his results never matched his prowess upon two wheels. According to Joe Saward's long ago feature story, Damon took up motorbikes 'cause he wanted to be different than his father. (Two-time F1 world champion Graham) Damon pursued his Scooters career in 1981 with modest success, but as Messer Saward points out, Damon was encouraged to go racing upon four-wheels by his Mum' who thought it would be safer! Damon's glory years in Formula 1 were with Williams, where he began as its test driver before replacing the departed Nigel Mansell - ultimately winning the 1996 F1 world championship after having finished runner-up to his protagonist Michael Schumacher in '94. Mark 'Handlebarz Webber grew up around motorcycles, as his father Alan owned a local dealership. Webber began by racing motorcycles before working his way up the Open Wheel ladder, with a stint as a tintop' driver for Mercedes, before pirouetting twice down the Mulsanne straight in the Aero-deficient Mercedes CLK GTR! Webber finally reached his goal of F1; as I still remember that incredible fifth place finish at Melbourne upon his debut Grand Prix for fellow countryman Paul Stoddart, Minardi's team owner. Webber's best years as a Gran Primo Piloto ultimately came during his tenure with Red Bull, albeit incredibly strained with his junior 'Punk team-mate Seb' Vettel, as Webber's best quip ever after crossing the finish line first was: "Not Bad for a No. 2!" Pedro, two year's Ricardo's elder, saw the brothers gravitating to motorcycles due to the influence of their father being chief of the Mexican Motorcycle Police. After being initially denied entry in Sports Car racing, Pedro (Age 20) & Ricardo are claimed to have put the fear of God into their competitors during a staggering drive aboard the N.A.R.T Ferrari at Le Mans in '60, and would have won if the car had held together! 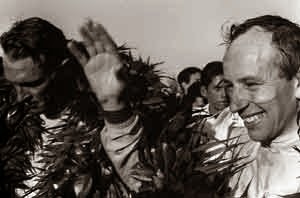 The younger of the two Rodriguez brothers was apparently more successful upon motorbikes, having won a national championship before setting his sights upon racing cars, where he and his older brother Pedro were highly successful behind the wheel - most notably of Ferrari's, with 'Il Commendatore, nee Enzo Ferrari signing Ricardo to a Formula 1 drive in 1961. Jean-Pierre was a phenom on bikes, having won eleven national titles before turning his attention to international motorcycle racing, contesting the 50, 125 and 250cc classes. I've had a soft spot for this Venezuelan racer ever since seeing a bevy of his BMW Touring Cars on display in a little town called Nurburgring, Ja Volt! But I'm getting ahead of myself. After winning the Venezuelan National Road Racing championship twice between 1973-74, Johnny captured global attention by first taking Pole position and then coming from dead last to finish third in the '75 Daytona 200 aboard a "mystery" Yamaha, before returning the following year with full factory support and defeating some Dude called "The King," aka Kenny Roberts for the victory! Ultimately, due to numerous bad racing injuries, Cecotto shifted his attention to four wheels by beginning in F2 in 1980 before tying for the title with Corrado Fabi, (Teo Fabi's younger brother) who won the title via tiebreaker. At the tender age of 14, Blundell took up Motorcross riding and progressed into a blossoming talent - winning championships before switching over to four wheels at 17. Mark showed prodigious talent with multiple FF1600 & FF2000 championship crowns before going international by jumping straight into F3000 along with driving Sports Cars. Blundell struck deals as a Williams and McLaren test driver while having largely unsuccessful results with Mid-pack runners due to his lack of budget. Yet I mostly remember this Englishman for two reasons. Firstly he replaced Bloody 'Nige at McLaren after Mansell's backside couldn't fit into the MP4/10! Although the majority of today's top F1 Starz don't participate in extra-curricular activities such as Sports Car endurance racing, nevertheless many of the drivers above have tried their hand at le Circuit de la Sarthe, better known as Le Mans - to varying degrees of success. John Surtees and Mike Hailwood both stood upon the Le Mans podium, each scoring a third place finish - Surtees for Scuderia Ferrari in 1964, while Hailwood co-drove to third place in the 1969 classic aboard a John Wyer Ford GT40 with some chap known affectionately as 'Hobbo, aka David Hobbs. Mark Webber's pursuits at Le Mans haven't been exactly encouraging to date, best known for somersaulting a Mercedes CLK GTR twice! Along with his high flying pirouette in Formula 1, perhaps he'll wish to become a "Wing Walker" in his next career? Preferably after his stint with Porsche in WEC. Pedro & Ricardo made waves during the 1960 24 Heurs du Mans before Ricardo finished second for Ferrari and Pedro won co-driving with Jacky Ickx in the epic '69 event behind the wheel of those iconic J.W. Wyer-Gulf Ford GT-40's.